The Cleveland-based baroque orchestra Apollo’s Fire, with their founder/ director Jeannette Sorrell, has made an indelible impression on the international music market since launching on Avie with recordings of Bach, Mozart and Monteverdi. 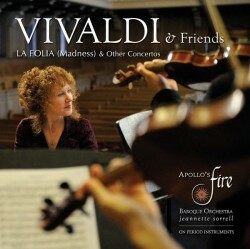 Vivaldi and Friends is a presentation of concertos by the Red Priest with a twist: two authentic Vivaldi Concertos – one for four violins, the other for two cellos – are interspersed with J. S. Bach’s transcript- ion of Vivaldi’s A minor concerto for four harpsichords, and Jeannette Sorrell’s own transcription of ‘Summer’ from the ever-popular Four Seasons. Sorrell’s arrangement mirrors the widespread baroque practice of transcribing violin works for keyboard. In her unique version, she performs the original violin parts on the harpsichord. The album ends with an enigmatic Tango Concerto by contemporary composer René Duchiffre, written in the idiom of Bach and Vivaldi for the unusual combination of two violas da gamba, and instrument not typically given the spotlight in baroque concertos and to the composer’s mind was unjustly neglected. The use of the Tango, a 20th-century dance form, is a nod to the characteristic use of dance forms during the baroque era.